My family and I were able to spend an unforgettable day kicking off the holidays at DCT by attending both holiday productions! Each show is about an hour in length which made for a perfect “mixed nuts” outing with one show featuring both the Peanuts Gang and the other, the timeless Nutcracker. We started off with THE NUTCRACKER. 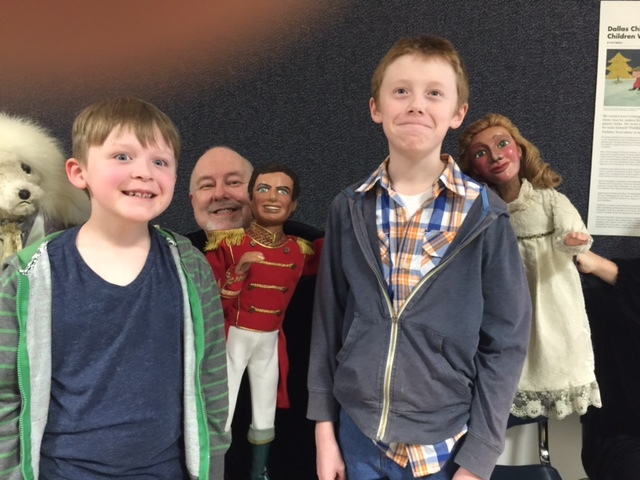 As we walked into the lobby, we were immediately greeted by a ten-foot tall Nutcracker who asked my boys, Chris (11) and Adam (7) to give him a high five. They were immediately ready for some fun! 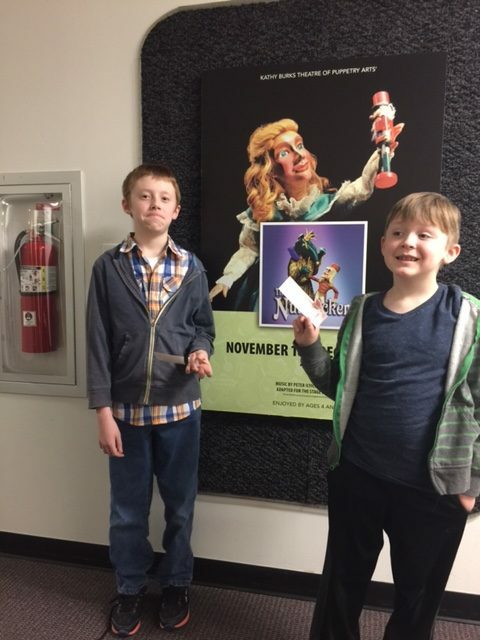 We went into the Robyn Flatt Studio Theater to take our seats for THE NUTCRACKER. 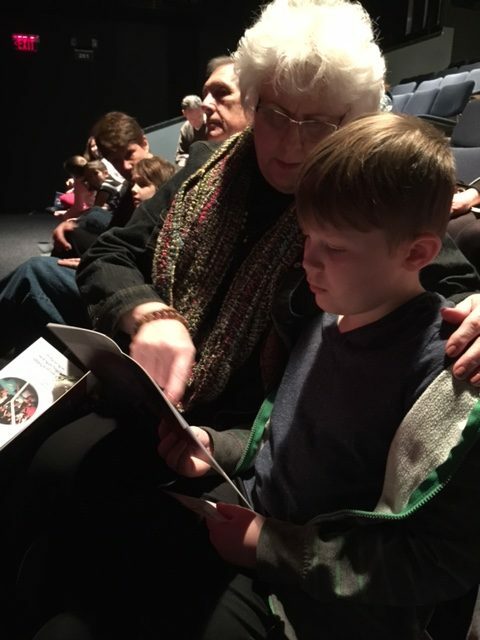 Chris was a little apprehensive about how close we were to the stage, so his Granny Pat took him out to see the display cases with the puppets so he would know they were not going to be frighteningly large. Of course once the lights go down, they look so much larger due to the magic of the black theater. The laughter started right off. This was my first time to see Kathy Burks’ Theatre of Puppetry Arts’ adaptation of THE NUTCRACKER, and I must admit that as an adult, I was drawn in by all of the surprises. I wasn’t prepared for how much physical humor could be created using puppets! The boys also loved the voices. They both laughed out loud throughout, especially during the battles with the Mouse King. I don’t want to give too much away, but we all loved the show and were so excited to meet the puppets in the lobby afterwards. Adam is due to go see THE NUTCRACKER ballet on a field trip later this month, and not only did he get a short (and funny) lesson on the writing of the ballet (as expressed by puppet Tchaikovsky himself), but he also got a condensed and super-kid-friendly puppet version that will help him follow the ballet so much better! Before the production of A CHARLIE BROWN CHRISTMAS, we took some time to visit Santa in the lobby. He was as kind and jolly as you would expect of Santa, and Adam had plenty of time to give him an exhaustive list, including what he wanted to eat for Christmas dinner! Santa got him giggling just by being his charming self. 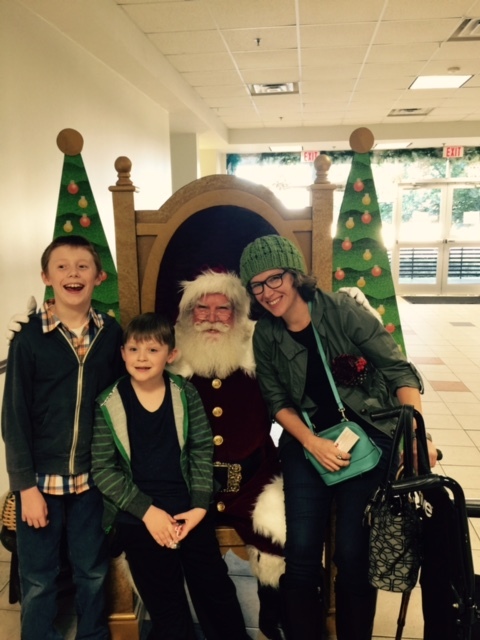 Santa was gracious enough to let me sit on his lap as well! Our day continued with A CHARLIE BROWN CHRISTMAS. I went in very familiar with the TV special, but the boys were experiencing it for the first time. We had fallen in love with a couple of the actors, Christopher Curtis and Steph Garrett when we saw SEUSSICAL THE MUSICAL earlier this fall, but they wer e almost too cute to handle in this production. 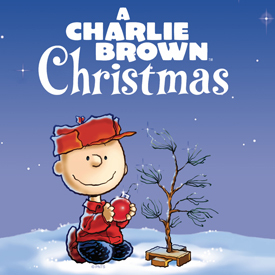 Charlie Brown was round-headed perfection, and we were sitting where we could see him up close as he pondered the meaning of Christmas. All of us were smiling from beginning to end with several hearty laughs throughout. It was as if I were watching the Christmas special come to life before my eyes, and for the boys, it was personifying Christmas and giving it meaning in a way they could understand. 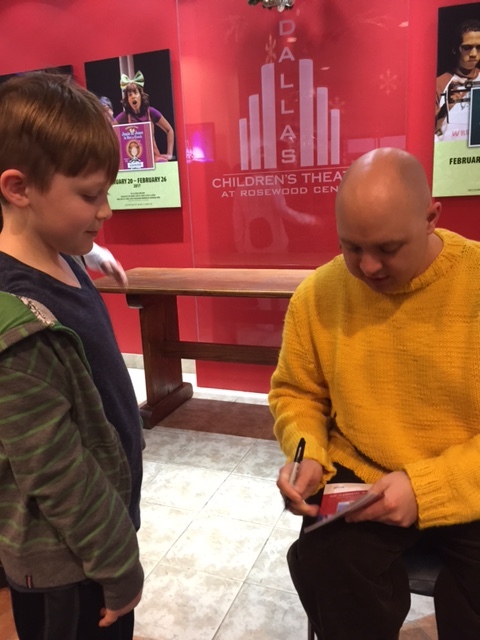 After the show, Adam went directly to Charlie Brown’s line and was thrilled to meet him in person. It was the best day we could imagine. From nutcrackers to peanuts, our day of mixed nuts was a perfect way to start off our holiday season. We had plenty of time for our two-show day, with no rushing from one to another. In the midst of the hurried holiday season, I encourage everyone to take a day to relax with your family and spend time creating great memories at the theater. Of course, now my sons are expecting me to get the tree up right away, so be forewarned… DCT knows how to create the holiday spirit! 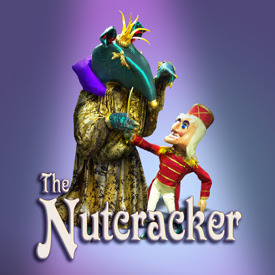 Note: The tallest Nutcracker a child has ever seen and Santa made a special appearance November 18 – November 27. They will return on Tuesday, December 20 and Wednesday, December 21. Buy your tickets now!